UFC 230 just got a massive main event upgrade. It was reported earlier this week that the UFC was working to get Daniel Cormier on UFC 200. The promotion’s desired opponent for “DC” was top-ranked heavyweight contender Derrick Lewis. Lewis comes off an amazing performance at UFC 229 over the weekend (Sat. October 6, 2018). He was losing for the majority of the three rounds he shared the Octagon with Alexander Volkov. However, in the closing seconds, Lewis ripped off a hellacious last effort blitz that knocked the Russian out. It was an amazing finish and really took mixed martial arts (MMA) fans by surprise. Furthermore, Damon Martin reached out to Lewis’ manager, who also confirmed the heavyweight title fight is indeed on. 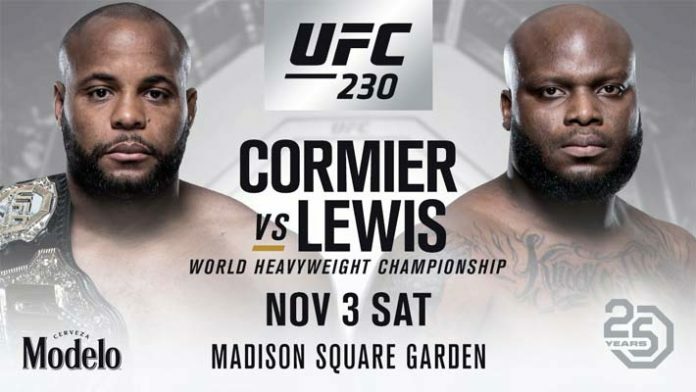 UFC 230 goes down live on pay-per-view (PPV) from Madison Square Garden on November 3, 2018.